Physical buttons, nobs and switches are still the best way to interact with a car as it allows the driver to reach to the control with just a minor glance sometimes. And I hope that in the future the luxury will be to have “analog” interfaces. 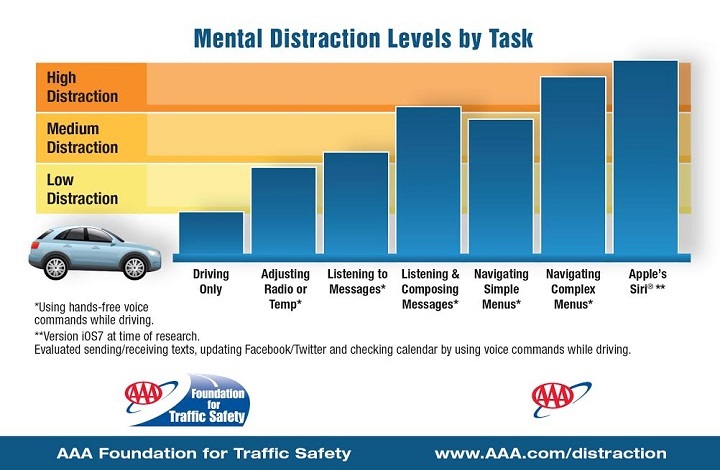 Recently I came across a study performed by The Foundation for Traffic Safety in the US, about the levels of distraction of a driver on normal tasks in a car. What caught my attention? A simple task like adjusting the radio produces the double of distraction as during normal driving. And using Siri interface produces the highest distraction level on this comparison. I would like to better clarify this last point with the authors, as Siri is a voice interface I wouldn’t expect that level of distraction. I’m surprised I haven’t seen many news on car accidents because of Tesla’s big touch screen. I never drove a Tesla, but it would be interesting to have a deeper insight on the driving experience of this car. Maybe I’m wrong. How can this problem be solved through technology? For car manufacturers is less expensive to put all the car controls in a touch screen than mounting all in different nobs and switches. But as this solution created challenges for the users, technology can also solve it. How? Through automated driving technologies, allowing the driver to safely abandon the steering wheel and assuming a more super visioning position. The Jaguar Virtual Windscreen concept seems a carefully designed interface with a bit of “gamification” as it is inspired by car video games and in line with the sporty soul of the brand. We still need to see the final execution of this interface, but if done seamlessly on the windscreen it might be interesting. On the other hand, the BMW head up display is a type of solution that seems more intrusive to the driving experience, compared to the Jaguar interface, but still a good help to keep the drivers eyes on the road. Daimler AG just presented a few months ago, is automated driving concept for trucks. Watch the video, where the driver leaves the steering wheel and is able to perform other tasks while the truck drives itself. So in conclusion, I think that touch interfaces that simply replicate the look and feel of normal buttons and switches, is a passing trend. It’s the result of a specific area of interaction design that doesn’t have enough research done. But it seems already very obvious that interfaces will need to be much better integrated (giving the driver just the essential info or allowing to explore more features, depending on the different moments of the driving experience) with the drivers life on board a car. And ultimately with the help of automated driving technologies, it will be much safer to use any kind of interfaces.